Do you think that applies to all clocks, or just flower clocks? We started our day in a very diplomatic way. The Palace of Nations was built between 1929 and 1936 to serve as headquarters of the League of Nations. The League of Nations crumbled leading up to WWII but following the end of the war the more successful United Nations was formed. 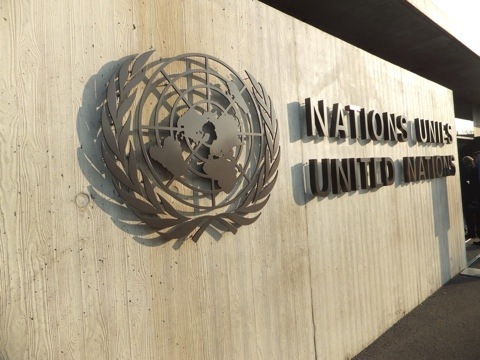 The initial purpose of the United Nations was to stop wars between countries and to provide a platform for dialogue. Today there are only 2 soverign states in the world who are not members. The first is the internationally recognized Vatican City and the second is Palestine, which is working hard to gain international status and has applied for UN membership. The UN has used these buildings since 1945 (though interestingly, Switzerland didn’t join the UN until 2002). Today the main UN headquarters can be found in New York…it is there that the more political and major issues are discussed and debated. 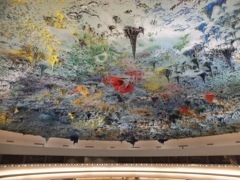 The UN offices in Geneva focus more on Human Rights. 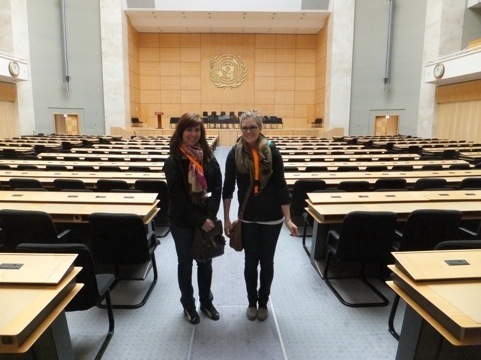 A regular person cannot just wander about the UN headquarters unattended, so we had to go on the guided tour. It took a little over a hour and was very interesting. We saw a lot of very big rooms where very important people who represent the entire world discuss very influential issues. At one point we stopped to overlook the Palace of Nations garden. It is quite lovely, but is regulated by strict security so we couldn’t actually go in it. At the center sits a really interesting sculpture. It is in the shape of a globe but is a projection of what you would see in the sky from any point at one specific time. All of the constellations weave in and out of each other upon it. This sculpture was dedicated to Woodrow Wilson, as he was the man who first came up with the idea of the League of Nations. The last room on the tour was also the newest in the Palace. It was only completed a few years ago and is now used for meetings related to human rights. It is circular shaped, to encourage discussion, and made entirely with materials donated by Spain. The most interesting part of the room has to be the ceiling. It was created by a Spanish artist to look like the bottom of the sea projected onto the roof. Justine totally guessed what it was before we were told, saying “I can imagine a piece of the Titanic in the middle of it.” Apparently the ceiling consists of a light, moldable plaster substance and 35 tons of paint! That’s one heavy roof art display! Knowing that we had plenty of time in our day we skipped the trams and walked from the UN to Old Town. 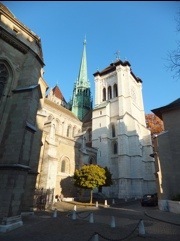 This is pretty much the two opposite corners of a tourist’s Geneva so it was a long walk. Along the way we had some intelligent discussions on world issues…apparently we were inspired by our visit. In Old Town we headed to Bastions Park. This is where we could find the Reformation Wall, but first we stopped off at a few other interesting things in the area. We spotted a man pushing a snow shovel over a smooth white surface and were immediately drawn over to it. Sure enough it was an outdoor skating rink. We really miss skating! No one was on it but we sat & stared for awhile anyways. Then we stopped off in a corner filled with giant chess & checker boards. There a couple of empty ones so we struck up a game. Kristin was all set to win until we gained a spectator who took it upon himself to tell Justine what to do. We guess, in the end, neither of us won…the random dude did. Finally we actually saw what we had came to the park to see: The Reformation Wall. 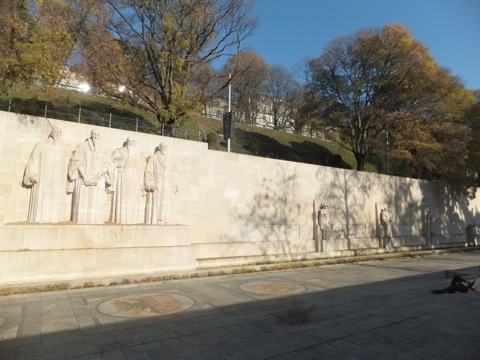 This wall honors many of the main individuals, events and documents of the Protestant Reformation which began in Geneva in 1536. Our afternoon/evening involved a large quantitiy of nothing. It was relaxed & random and will only warrent a very short paragraph. We walked through some more of Old Town, had a blog-writing break at Starbucks, walked along the water in multiple directions and finally went for dinner. We went to the same pasta place as yesterday as we hadn’t located a place that could beat it’s prices. 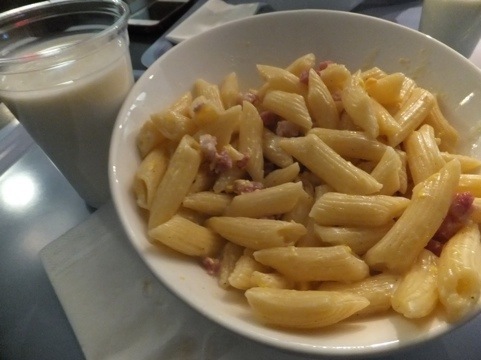 The Pasta du Jour was Mediterraneenne (so many crazy letters going on there!) 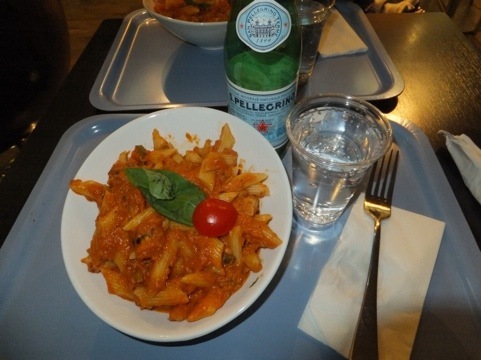 which consisted of the house tomato sauce, tuna, olives and fresh basil. Yummy! *Gasp* I wish that was my house! Hello folks! We are on Day 3 of Switzerland and have now hit up our second city. It’s only a short ride from Bern to Geneva so we were in no hurry in the morning. Still we were at the station with plenty of time to catch the 10 o’clock train. 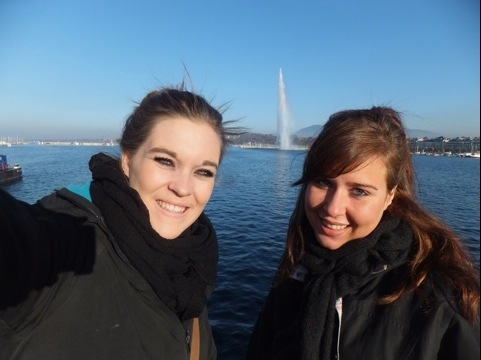 An hour and 45 minutes later we were in Geneva and walking to our hostel. Unfortunately we got there just after noon and the reception staff takes a lunch break from 12 till 1. After a few minutes sitting on the street someone left the building and we snuck in. The common area was a comfy enough place to wait out the next hour. We’d had some trouble finding somewhere to stay in Geneva and had ended up having to book a double room…it cost a bit more, but in the end it’s nice to have our own space sometimes! With the whole afternoon ahead of us we set out to see some of Geneva’s attractions. 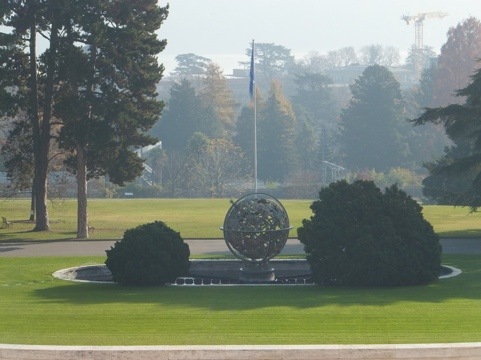 Geneva is the second largest city in Switzerland and one of the world’s major centers of international diplomacy. 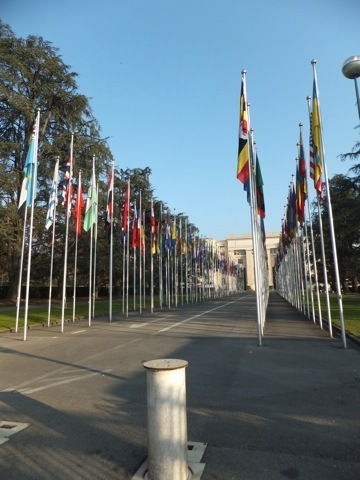 The League of Nations was based in Geneva, followed by the United Nations after the Second World War. 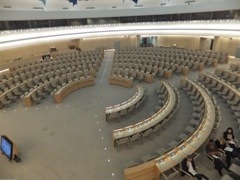 While the UN headquarters are now in New York, the organization still retains a large presence in Geneva. 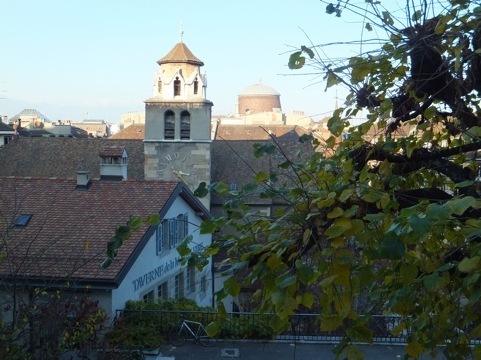 Geneva is a French speaking city and constantly ranked near the top of the ‘Most Expensive Cities to Live In’ list. We would describe the city as very nice, clean & wealthy looking. It seems like a place that would be wonderful to live in (other than the exorbitant prices! )…safe, comfortable and like it might have a good local pulse below it’s surface. But as a quick-visit traveller it lacks some of the character & initial pull that makes you want to explore further. In other words, it’s a lovely place but if you’re only hitting one place in Siwtzerland make it Bern. Bern feels like Switzerland, Geneva seems like a nice big city. The first main and extremely obvious sight we happened upon was the Jet d’Eau. In the simplest of terms, it’s a huge column of water shooting into the air. But let’s do a more detailed description…This fountain of water is pumped 140m into the air! The spectacle was once an occasional pressure release for hydropower generation on the Rhône River, but people liked it so much that in 1981 the city created the permanent fountain. We were glad we saw it when we first started our walk because when we were walking home it was turned off. We don’t know what the rules or hours of operation or whatever are for the fountain, but it’s a cool sight to make sure you catch. Immediately beside the main bridge over the lake is another of Geneva’s world famous & really random attractions. This one is a large clock…made of flowers. 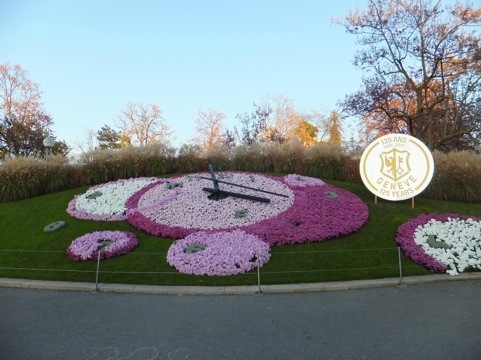 The Geneva flower clock is a symbol if the internationally known Swiss watch industry. This clock from 1955 is considered a technological and floral art masterpiece. It reminded us of Alice in Wonderland so we came to the conclusion that we liked it. The St. Pierre Cathedral is the highest point on old town. The Cathedral, originally Catholic, now symbolizes the high points of the Protestant Reformation. We walked up to slanty streets until we could have a good look at it. 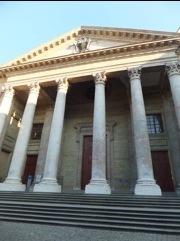 The styles were a little mismatched and the front looked more like a civic building than a church with all of those columns. The nicest part had to be the big spire in the center…we could only imagine how nice it would have been when it was still shiny copper, as opposed to the current green. The view from the church area was quite nice, but in a different way than our “up high” views normally are. This look-out was only at roof level, as opposed to above it. After supper we relaxed, ate a fondue (we really need to get out of Switzerland soon as fondue every night is going to make us weight a zillion pounds), and watched old episodes of Glee.